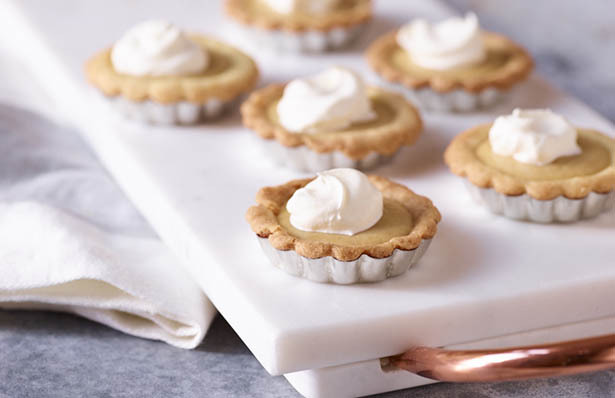 Impress your guests with homemade mini tarts filled with thick, creamy caramel and topped with whipped cream. Preheat oven to 350˚. Spray 16 mini tart pans with cooking spray. Set aside. Cream butter and 1/2 cup sugar together until light in color using an electric mixer or food processor. Add 1 egg yolk and lemon zest, mixing until well blended. Add flour and mix just until dough begins to form. Stop mixer, remove dough and shape into a disc. Cover with plastic wrap and refrigerate 25 to 30 minutes. Divide dough into 16 equal pieces and press into a round on a floured surface. Press rounds into mini tart pans. Bake 10 to 12 minutes or until golden brown. Remove from oven and cool 20 minutes before filling with caramel. Cook 1/4 cup sugar in a small sauce pan over medium heat until it caramelizes and begins to turn golden brown. Remove from heat. Slowly add milk. Return to low heat and stir until the sugar has dissolved into the milk, about 5 to 8 minutes. Set aside. In a medium bowl, whisk cornstarch and 1/2 cup sugar together. Add remaining 6 egg yolks. Mix until well blended. While whisking, slowly pour half of the warm milk into the cornstarch mixture. Blend well and return to saucepan. Cook caramel filling over medium low heat while stirring constantly until mixture thickens, about 6 to 8 minutes. Pour caramel into tart shells. Chill in refrigerator 2 to 3 hours before serving. Top with whipped cream.